Guests will be gathering at either Kabukicho Police Station or in front of Cocoon Tower at Shinjuku Station West Exit. We will then depart and take Chuo Expressway with a short break at Dangozaka SA, and continue with Fuji Subaru Line to reach Mt. Fuji 5th Station at 2400 meters’ high. Not only the scenery along the way is pretty, but view upon getting to the top of 5th Station is breathtaking with cloud sea coming into sight. There are also shops over there you may want to check out for a lovely souvenir. Lunch will be served with Yamanashi’s local cuisine Hoto noodle set that has a rather long history of over 1000 years. This special tasty noodle is made of udon noodle and vegetable; vegetarian menu is available upon request. Next we will head towards the venue of Fuji Pink Moss Phlox Festival that is held from mid April to late May. 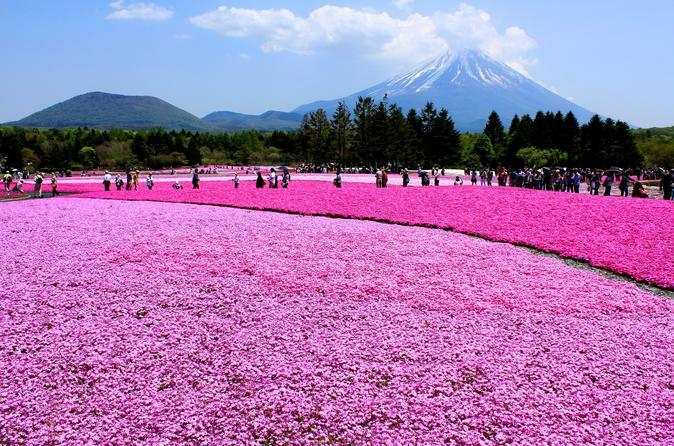 About 800 thousand Pink Moss Phlox bloom on the vast land of Fuji Lake Motosu resort. The gorgeous view is composed with grand Mt. Fuji as background, as well as the flowers dyed in graduation of pink and white color. Last stop will be orchard for strawberry picking. Strawberry in perfect balance of sweetness and sourness is provided in all-you-can-eat for 30 minutes. So please seize the chance to relish this seasonal flavor to the fullest! The trip will be ended upon arrival back to Shinjuku Station West Exit.